This school of boxing imitates the forms and movements of animals with the stress on the hitting features of their movements and actions. 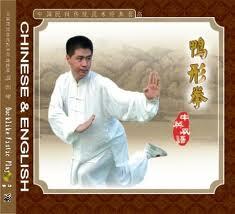 These are then developed into fist plays by combining the offensive and defensive skills of the martial arts. Such animal-imitating boxing styles include monkey boxing, mantis boxing and eagle-claw boxing. The movements look like a dragon flying, a tiger jumping, a clever monkey clattering, an eagle soaring, a crane standing, a snake roving, a duck waddling, a dog leaping, a rooster pecking and a mantis wielding its forelimbs. Animal-imitating boxing has a long history. The Book of History compiled before Christ records dances that imitate the movements of 100 animals. The ancient book of Huainanzi also recorded the exercises of ducks bathing, monkey looking for food, hawks roving and tigers watching. The six-animal exercise of the Han Dynasty and Doctor Hua Tuo's five-animal exercise as well as Ge Hong's animal-imitating exercises are all indispensable to the creation of the animal-imitating boxing. Ge's animal-imitating exercises included movements of dragon flying, tiger walking, bear strolling, turtle swallowing, oriole flying, snake coiling, bird spreading wings, monkey squatting, and rabbit being startled. Tricks in the animal-imitating boxing, and animal-imitating moves in other boxing styles are numerous. 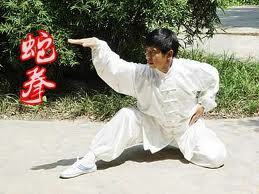 In the Shaolin boxing there are five animal-imitating routines-dragon, tiger, leopard, snake and crane. Fiery dragon boxing is featured in the Emei boxing school while crane, dog and tiger-crane movements are incorporated in the southern-style boxing. In Taijiquan there are white crane spreading wings, wild horse dividing mane, golden roosters standing on one foot and white snake hissing and protruding the tongue. The eight-diagram palm play has such animal imitations as hawk soaring, monkey picking fruit, swallow skimming the water surface, eagle spreading wings and lion opening mouth. The back-through boxing has lone swallow leaving a hoard, monkey jumping out of a cave and swallow piercing through clouds. The animal-imitating boxing does not merely confine itself to the imitation of animal movements. The movements are frequently a refinement of the animal's. For instance a real mantis cannot wield its claws as rapidly as an animal-imitating boxer wields his fists. Those animal-imitating boxing routines now in fashion are more concerned with the successful execution of imitations and adding difficult turns and twists. An excellent routine of the animal-imitating boxing is one which combines true-to-life imitation and the attack and defence skills of the martial arts.